The essay inquires a general question: what is the relationship of theater and human rights? A preliminary reflection is provided using the different activities staged at the Cultural Center of the Philippines (CCP) on the occasion of Pista Rizalina (Fiesta Rizalina) in September 2017. The festival was named after Rizalina Ilagan, a student activist-artist abducted by the military during the Martial Law era under President Ferdinand E. Marcos. To date, Ilagan’s body has not been found. The festival is a commemoration of the victims of human rights violations encountered by thousands of Filipinos since the Martial Law era of Marcos. In the end, it is argued that performing human rights at the CCP is a tool to transmit traumatic experiences for the understanding of those who did not suffer violence, oppression and tyranny (i.e. today’s younger generation). The relationship of theatre and human rights is asserted to be a rehearsal for a community where the other is encountered with care and responsibility. TIATCO, Sir Anril P.; VIRAY, Bryan L.. 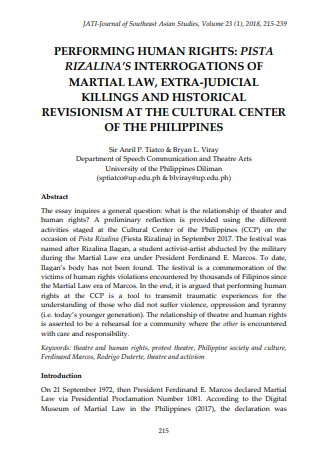 PERFORMING HUMAN RIGHTS: PISTA RIZALINA’S INTERROGATIONS OF MARTIAL LAW, EXTRA-JUDICIAL KILLINGS AND HISTORICAL REVISIONSM AT THE CULTURAL CENTER OF THE PHILIPPINES. JATI - JOURNAL OF SOUTHEAST ASIAN STUDIES, [S.l. ], v. 23, n. 1, p. 215 - 239, june 2018. ISSN 2600-8653. Available at: <https://jati.um.edu.my/article/view/12193>. Date accessed: 26 apr. 2019. doi: https://doi.org/10.22452/jati.vol23no1.10.